The coffee mornings are informal gatherings for people with MND and their carers. Refreshments can be purchased in the coffee shop at Notcutts and at Cherry Lane. The Notcutts coffee mornings start at 11am and finish at 1pm on the third Wednesday of each month - except December. The Cherry Lane coffee mornings start at 11am and finish at 1pm on the last Wednesday of each month - except December. Sunday 7 April 2019 1pm - 5pm – the Annual General Meeting will be held at St Andrew's Eaton Church Hall, Church Lane, Norwich, NR4 6NW. We are delighted that Richard Cave, a Speech and Language Therapist seconded to the MND Association for the Voice Banking at Diagnosis Project, is able to join us as guest speaker. The meeting will start with the AGM business at 1:00pm prompt, followed by a buffet lunch and then Richard’s presentation. We will hold our usual raffle and will have MND Association goods for sale. Sunday 23 June 2019 1pm - 5pm at Upton Village Hall, Cargate Lane, Norwich NR13 6AU. We are very pleased that Dr Mamutse, Consultant neurologist at the Norfolk and Norwich University, has agreed to be our guest speaker. "I am taking on the biggest challenge of my life to raise money for MND research after my Mum was diagnosed with MND in November 2018. I will be running 53 miles, through the Scottish Highlands over 7,500 foot elevation in April 2019, my Mum will be in my mind with every step, motivating me on to the finish line. I hope to complete it in approximately 10/11 hours. If I can raise awareness for MND along the way and help us get one step closer to finding a cure then it will make me happy." For more details about The Highland Fling Ultramarathon click here. Jemima, John Newport and a team of volunteers will be holding a bucket collection at Notcutts Garden Centre, Daniels Road, Norwich, Norfolk, NR4 6QP. We hope that you will come and support us! Jemima, John Newport and a team of volunteers will be holding a bucket collection at Thetford Garden Centre, Kilverstone, Thetford, Norfolk, IP24 2RL. We hope to see some of our supporters and branch members from the south of our branch area. Everyone is very welcome to come and meet Jemima, a 1937 Morris Eight, and John outside The Forum in Norwich between 9am and 6pm prior to her road trip in August. Sue and other volunteers will be joining John and holding a bucket collection to raise money in support the work of the Norfolk, Norwich and Waveney Branch. If you would like to help with the bucket collection please contact Sue Heal at sueheal@btinternet.com We feature on the Forum’s website. When John Newport’s old friend Norman died from MND, he decided to do something worthwhile in his memory. Norman had a collection of old cars in his Welsh barn, one of them being Jemima, a 1937 Morris Eight pictured on the right. Jemima had not been driven for many years and was in quite bad shape. 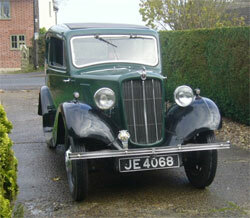 John arranged with Norman’s widow to have Jemima brought to Norfolk for repairs, and she is now back on the road.